Preamble | Are You A PIG? With all these Multicultural mutants yammering about 'diversity' and 'promoting diversity'. I'm compelled to point out that individual diversity represents the ultimate diversity, the only true diversity. It's pointless to pigeon hole everyone into convenient little boxes/categories based on meaningless factors like ethnicity, skin pigmentation, gender, Nationality or sexual orientation, none of which expresses a single iota of useful information about their tribal adherents. These Diversity Demons would do much better if they concentrated on the endless variety - diversity if you prefer - of individuals, each of whom embodies a special set of skills, attitudes, ideas and even deficiencies. When individuals combine their various skills/aptitudes - voluntarily - to work toward a common goal, true diversity's awesome power is unleashed. Conversely, the mindless diversity zombies who march in lock step with their tribe, always shouting the tribal 'truths', invariably wearing the tribal garb, shrieking mindless drivel about their tribal culture, sacrifice whatever individual skills/aptitudes they might possess to become another tribal robot. As such, each of these tribal robots seeks to be identical to, indistinguishable from, his tribal brothers and sisters. According to Webster's Dictionary 'diversity' means 'different', 'unlike'. This certainly defines the very essence of individualism-based diversity. Ironically, the nature of Multicultural-based diversity is the exact opposite of Mister Webster's definition. Multicultural diversity promotes sameness by squeezing these endlessly diverse individuals into tribal clumps, forcing them to adopt tribal attitudes, tribal sensitivities, tribally-correct speech, tribal dress, even tribal thinking (a one size fits all set of authorized, multipurpose, responses which the tribe member commits to memory). Multiculturalism's goal is to make every member of a given tribe identical to the next, as a first step toward forming them into an even larger tribe, the 'national tribe'. Eventually, they mean to form the ultimate tribe, a world tribe, killing the individual differences which makes every person unique. Suffice it to say that, before you can add your name to your tribe's membership roll, you'll need to check your brain at the door. Recognizing, fearing, the power of this true, individual-based, diversity, the Neo-Marxist elite, guiding this multicultural madness from their tenured teaching posts in America's colleges and universities, declared individualism a racist concept. In a way, individualism is a racist concept, but it's not the cross burning intolerance that the multiculturalists wave like a red flag. Individualism is racist - to card carrying Ethnocrats - because, by its very nature, it exposes the utter irrelevance of race/ethnicity/skin pigmentation. Since race, ethnicity, and skin pigmentation tell us nothing about a person's thoughts, actions, beliefs or skills they must be ignored. They are, in reality, no more informative about a person than their eye color, height or shoe size. It's easy to determine why individualism is feared by the Neo-Marxist elite. A sovereign individual refuses to be distracted by these grossly-overrated hyphenating factors (ethnicity, skin pigmentation, et al). Instead, the individualist will evaluate each person as an individual, deliberately ignoring any essentially-irrelevant, hyphenating, factors. For a card carrying tribe member seeking to hide in the faceless tribal horde, this can be a terrifying prospect. The pseudo diversity with which the Neo-Marxist bludgeon us is nothing more than a scheme to divert us from their collectivist intentions. 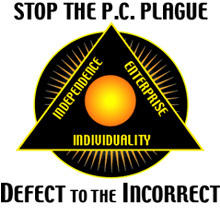 In the name of promoting a 'positive self image' - the term 'self-esteem' is an individualist term and, thus, racist by association - the Multiculturalists encourage the hyphenated tribal horde to repudiate individual responsibility for their actions, demanding that each cringing tribal mutant cower behind the empty shell of a group identity. Freed from individual accountability, separated from the onerous task of thinking for oneself, the tribal horde is now ready to join that Politically Correct tribe of 'society as a whole''. I'm endlessly amazed that so many people, most of whom would recoil at a tribal affiliation, willingly, eagerly pigeonhole themselves with a one word label intended to define themselves for the rest of the world's benefit. The same people who sneer at labels like 'African-American', 'Hispanic', 'Latino', 'Asian-American', 'Native American', et al, deny their own individuality with 'liberal', 'conservative', 'Libertarian', 'Christian', 'Muslim', 'Jew' and the like. Labels are a trap, one that automatically makes you something to be sorted, sized, and, ultimately, dismissed, without the evaluator being forced to deal with you, the individual. That's why, when I'm asked to define myself - in one word or less, no doubt - I leave such questions unanswered.